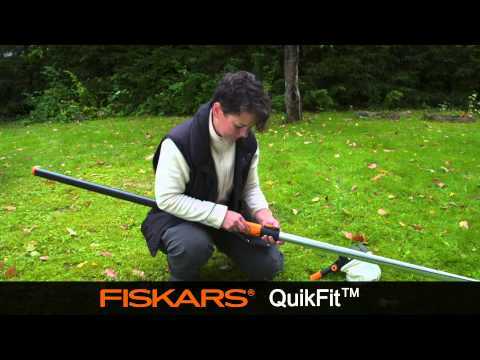 One of Fiskars most loved and efficient cutting tools gets a new spin with the Fiskars QuikFit Tree Cutter which offers enhanced cutting power with PowerReel mechanism. Lever and reel bring x12 cutting power compared to standard mechanisms. Simply attach the tree cutter to one of the telescopic shafts in the QuikFit range and enjoy cutting branches from the safety of the ground. The tool's cutting head angle can be adjusted to a second position of 26° angle without having to lower the product. The way the tool attaches allows for a two-hand hold brings and thus added stability. With no external ropes on the cutting head, this tool head will not get snagged and cuts efficiently with every pull.